Foodies Festival returns to Bristol Harbourside on July 13-15, 2012 – to form part of the UK’s largest celebration of food and drink this month. Food-lovers are invited to feast on the vast array of culinary activities taking place over the 3-day event including chef demonstrations and food masterclasses. Now in its sixth year, Foodies Festivals also take place across the UK in Edinburgh, Brighton, Battersea Park, Hampton Court Palace, Tatton Park and Oxford. Top chefs, including Channel 4’s Iron Chef UK Martin Blunos, Louise McCrimmon of Harvey Nichols, Romy Gill of Romy’s Kitchen, Sam Moody of The Bath Priory, and The Daily Telegraph’s Xanthe Clay will cook signature dishes live in the Chefs’ Theatre and explain how amateur cooks can prepare the same dishes at home. The popular Food and Drinks Masterclasses invite visitors to be amongst the first in the UK to sample new products, brush up their skills as well as learn new tips and techniques. There are 100 places available at each session, where experts will be sharing their knowledge and giving out samples. Over the course of the weekend there will be classes from Hendricks Gin, gourmet sausage making with Pig & Co, wonderful wines with expert Charles Metcalfe and traditional Jamaican street food with The Backyard Company. New to Foodies this year is the Kids’ Cookery Theatre, run by Beverley Glock of Splat Cooking and sponsored by Lakeland, where youngsters will be encouraged to cook up a storm. 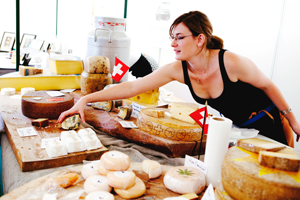 On Saturday and Sunday there will be all sorts of gastronomic experiments going on to keep the children occupied. Also new is the City Beach – complete with sand, deckchairs and beach-huts selling ice-cream, tea and cocktails; Street Food Avenue – serving quality dishes from around the globe and the Great Taste Market – selling award-winning goods from the UK’s top producers. Tickets for Foodies Bristol Harbourside, ehich start at £10, are available from www.foodiesfestival.com or by calling 0844 995 1111. Times: Fri – 11am-7pm, Sat – 10am-7pm, Sun – 11am–7pm.